Owner and operator Brad Miles has over 25 years of experience in the drywall business, but has now decided to focus his expertise solely on ceilings! 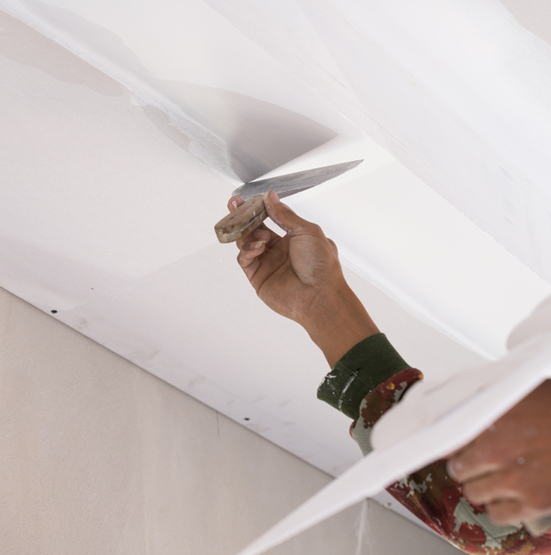 Many homeowners are confident when it comes to painting and patching their walls, but the ceiling is another story. Don’t hesitate to call Just Ceilings in Hamilton, Ontario – because ceilings are all we do! Looking to invest in a home improvement project that will truly make a difference? 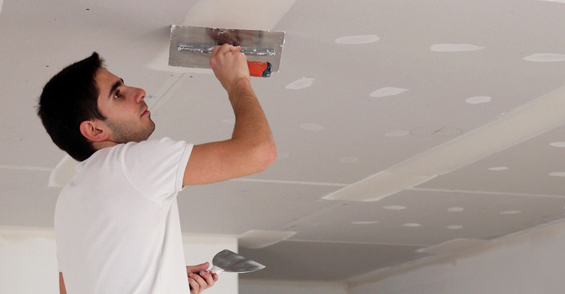 Make your room look bigger and cleaner with an updated ceiling! In need of repairs, restorations or removals – simply call Just Ceilings at 905-541-5292 for your free, no obligation estimate. Brad Miles of Just Ceilings literally only works on ceilings! Why call a general contractor, when you can have a seasoned specialist? When it comes to ceilings – he’s your man! Ceiling Repair – cracks, water damage, etc. Leave your ceiling renovations in the hands of a professional – call Brad Miles today at 905-541-5292. Brad Miles owner operator of Just Ceilings is a Godsend, a true blessing, and a perfectionist. I will only use his services because he knows his stuff & is very artistic when it comes to ceiling repairs or restoration. I would EXTREMELY recommend his work to anyone. For excellent work at a very fair price call now. Rest assured that you just made the best decision for your ceiling work. The workmanship is the best, and you will be proud to show off his work! Brad is a standout and a rare find when it comes to honest and trustworthy contractors! His workmanship is truly AMAZING and I would HIGHLY recommend his work to anyone. If you're looking for quality at a fair price - call him and know that you just made the best decision for your renovation work. I cannot say anything more than he is the best, and you will not be disappointed! Awesome service and great price. I would recommend Brad any time for ceiling repair and painting. My wife and I had the pleasure of working with Brad on a complete renovation of a 4000 square foot property. His work is outstanding and his enthusiasm for what he does is remarkable. We could all learn about attitude when it comes to one’s profession. My friends who are in the renovation business after looking at his work say he is a gem and artist at what he does. Brad came to my home to repair water damage to my ceilings, remove the cove and stucco. I have had a number of trades and contractors through my home over the last year and Brad was a god send. His work is next to none, the ceilings are beyond beautiful! But more then that Brad shows up everyday and works harder than any other trade I have had the opportunity to work with. He is at all times professional and to say he is a perfectionist is a understatement. I highly recommend him. Brad just finished removing popcorn stipple from our upstairs ceilings on Friday and the result is brilliant. He responds promptly, shows up on time and does what he promises. I also loved that he was more then happy to take the time to show me every step of the project as it progressed...simply to satisfy my own curiosity. I also liked that he was willing to work on one part of the house at a time, versus tearing the whole house apart like others. We will have Brad back soon. My wife and I cannot say enough about the job Brad did to replace our kitchen ceiling and restore our walls for painting. Not only is the workmanship of the highest calibre but his mannerism and expertise in general make him delightful to work with. He is prompt and took only 4 days from start to finish. We recommend anyone wanting great work at a reasonable price to give Brad a call. Brad came to repair water damage on our ceilings. He is amazing.The work he did is perfect.He is reliable, showed up at the exact time he said he would is very honest and professional. Prices are very reasonable for the wonderful job he does. Thank you Brad, you were a God send to us. Brad came to our house to repair our popcorn ceiling and it was such a great job! Thank you so much!! Brad Miles removed the popcorn ceiling in our living room and smoothed out our dining room ceiling. What a great job on both! He was prompt, friendly and professional. We are very happy with his work and would refer him to anyone. Brad removed the popcorn ceiling in our living room/dining room,and made repairs to some water damage. We were so pleased with the stellar job in those rooms that we brought him back a couple of months later remove all popcorn ceilings on the ground floor. He did a fantastic job, takes great pride in his work as we would highly recommend him. Our ceilings look brighter, higher and the new smooth finish is great. Thanks Brad! Brad just completed an extensive job at our home. He expertly removed all of the popcorn spray from our ceilings and restored them to absolute perfection! He truly is an expert at his craft. Our vaulted ceiling in the family room is an absolute work of art! Brad is an extremely hard worker and we would recommend him to anyone. Outstanding work for a fair price. You will not find anyone better than Brad! Brad removed and repaired the textured ceilings in our condo. The finish is flawless. He was able to complete the job in a timely way and did some other minor repairs and fills in the walls for us as he went around. He is a perfectionist and you can tell he loves his work.I had never thought about ceilings as art until I met Brad. We highly recommend him.